Catholic Penance is the way we reconcile our lives back to God's ways. It's God's way of clearing the way for Catholics to come home to Heaven. The word penance can be understood several ways. The two main ways for Catholics are as the sacrament of Penance and as the works we do in reparation for sin whether assigned by the priest or performed at will. As the work given by the priest to repair for the sin forgiven in the sacrament of Penance, it is the prayer or works. As a personal penance it is chosen by the penitent. Here penance is understood as a voluntary work that the penitent uses to either repair for sins committed, add power to a prayer, or to simply add to his store of supernatural grace. Catholic Confession is the telling of my sins to a priest to have them forgiven, NOT a group effort to "examine our conscience" as in some catechisms. Why do we say that we're going to confession? Simply, Penance is the sacrament, confession is the telling, and the penance is the work performed. What Is Sin? Sin is disobedience to God's law. It's super simple and why learning the Catholic Ten Commandments is so important in preparing for confession. 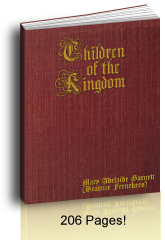 Most catechisms based on the Catechism of the Council of Trent and the Baltimore Catechism, like The Catechism Explained and Jesus Comes, teach what God's Law tells (commands) and forbids in the Ten Commandments. Q: What is the sacrament of Penance? 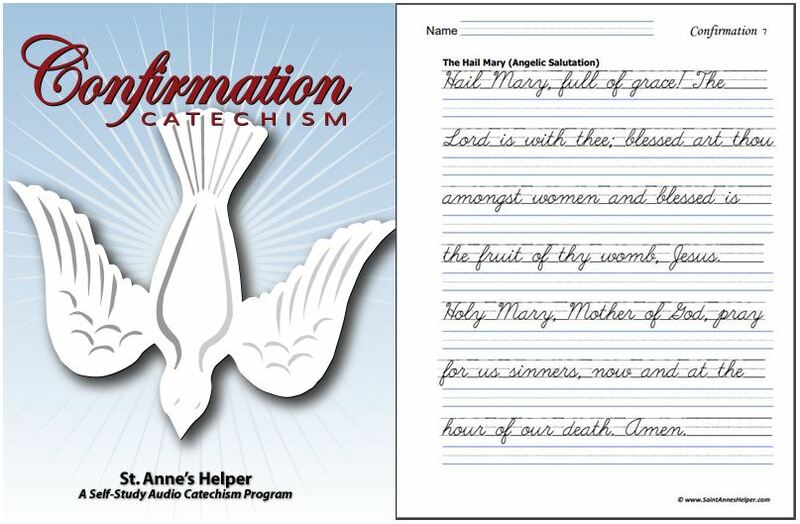 For those using the Baltimore Catechism, Saint Anne's Helper offers plenty of review. A complementary Catholic catechism for children that teaches about First Reconciliation is Jesus Comes by Neumann Press. These are also super condensed versions for adults to use as review or "Cliff Notes"! Truly a child's catechism is an excellent review. 2. Be sorry for my sins. 3. Make up my mind not to sin again. 4. Confess my sins to the priest. 5. Do the penance the priest gives me." After that you simply do the penance the priest gives you and thank God for forgiving your sins. Thank God indeed! The greater sorrow one has for his past sins the greater his joy after absolution because he receives greater graces! (Catechism of Pope St. Pius X) A good Catholic booklet on the sacrament of Confession that teaches this truth well is Confession: Its Fruitful Practice by Tan Books. It also has an excellent Examination of Conscience. We heard one good priest quote St. Alphonsus Liguori as saying that the reason a Catholic penance is usually not longer than a Rosary is that God wants us to hate the sin not the penance. What a consoling thought. We usually go to a confessional in a church to make our confession and there are usually set times so one does not have to make an appointment. If there is an emergency or if one is coming back to the Church, it's good to set an appointment for a longer meeting and the opportunity to seek advice. Churches and chapels usually have very traditional confessionals somewhere in the nave, usually in the back. It doesn't take courses and studying to come back to the Church, simply go to confession. Father will tell you what to do after that. 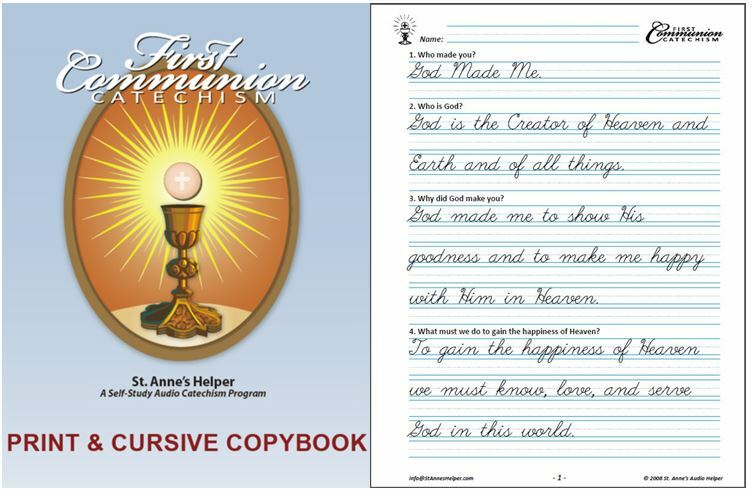 Saint Anne's Helper CDs and worksheets cover Catholic Penance in the First Communion downloads. The Confirmation catechisms add the words to the definition "through the absolution of the priest". If you're teaching children about the sacrament of Penance, you can order Baltimore Catechism worksheets and ebooklets here. A. What Do You Say In Confession? "I am sorry for these sins and all the sins of my past life." Father will give a short word of advice and tell you your penance, and will then ask you to say the Act of Contrition prayer. You receive more graces if you say the perfect Act of Contrition as it expresses your love for God. Find the perfect Act of Contrition as taught in the Baltimore Catechism here. Father then blesses you and may ask you to pray for him. You may answer if you like or simply leave the confessional. Now you pray the penance father has given. When do you do your penance? Right away. It is best done immediately (so one does not forget the penance or forget to do it) in the church (all prayers are enhanced before the Blessed Sacrament). Where do you go to do your penance and make a thanksgiving? 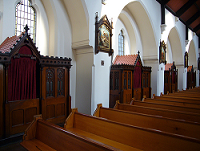 If the chapel is very small it can be good to go to the communion rail or front pew so as not to be distracted by the movement of the confession line or to distract or overhear the penitents there. 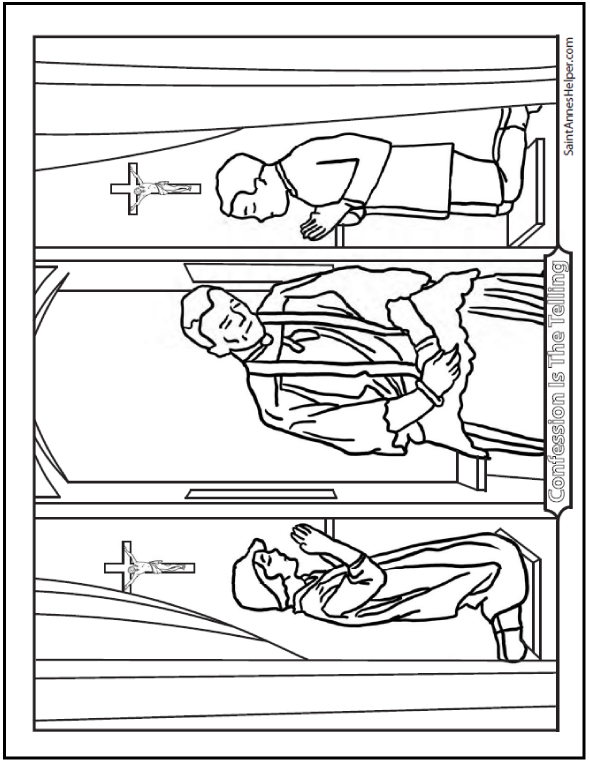 If there are other lines of penitents then simply chose a pew away from the lines and kneel there. Remember to say the penance the priest gave first and then, after that is well said, thank God for forgiving your sins. What about a personal penance? A personal penance does not have to be a giant and gruesome work nor is it attached to the sacrament of Penance. The Church teaches that praying, fasting, and giving alms are very good sacrifices that we can use as penances. The best penance according to Our Lady of Fatima is simply to do one's duty of state. We can add being cheerful or being careful to increase the merit of our works. Do consult with a priest before committing to any unusual or burdensome penance. What should one do when either the penitent or the priest is so loud that he can be heard in the church? Usually this only happens with very small children so humming quietly or whispering the Hail Mary can cover the moment. Yet sometimes the cause is a poor door or curtain. In that case some parishes put a noisy box fan near the outside of the door or curtain. Only very seldom is it the priest who is loud enough to be heard, and often he is a new priest or a very old priest. In this case plug your ears and/or quietly hum or whisper prayers; then caution him when it is your turn. Another idea is to begin the Rosary, or a decade of the Rosary, outloud. Other penitents will be very happy to answer in this situation. We have been edified to see these very things. As a matter of fact the parish that we attend frequently has over eighty First Penitents. Sister usually has one of the attendant parents or other parishioners lead the Rosary while she attends to the children in line. A child can be too loud his first time or two since he has memorized to be sure to say the Act of Contrition loud enough for the priest to hear him! By confessing one's sins one can avoid going to Hell, and hopefully with the right dispositions, one can avoid going to Purgatory. When you are looking for Catholic Penance in a newer book, look for Catholic Reconciliation. We have seen catechisms differ on the number of people involved. Some ask the child to memorize that "We examine our conscience." Without realizing that "we" don't have "a" conscience, one might mistake that others will know one's own sins, especially a young child. This false idea is inferred to adults as well. We are grateful the good priests in the many churches and chapels that we have been in who have kept the traditional sacrament of Penance. Did you know that all graces you have received from the other sacraments (Baptism, Confirmation, Holy Orders, and Matrimony, etc.) can all be restored by a good Confession? This sacrament is so important! Think of having all of these graces restored! The booklet called Confession - Its Fruitful Practice explains this according to St. Thomas Aquinas on page 18 (Tan Books). He explains that the restoration of graces is proportional to the penitent's sorrow. Our sorrow is best aided when we ask the Holy Ghost to come to us and when we think of Our Lord's Passion and Death. Sorrow is simply wishing that we hadn't done a thing. Once we realize that, it is easier to be truly sorry. Remember, "proportional" to my sorrow. The more sorrow I can raise the more graces I, will receive! This is so important because when sin darkens the soul the intellect and the will lose their strength, then the cycle just gets worse. This is why so many people cannot see truth (the use of the Intellect) or choose (the use of the will) the better thing. It is a comfort to know that one's privacy is protected by the door or heavy curtain. The grate between the priest and the penitent offers further privacy and is a great aid to the "secret of the confessional". No wonder people do not want to receive the sacrament of Penance when they have to sit in front of a priest with no screen. Some "Reconciliation rooms" even have a window to the nave! A further deterrent! Even the darkness serves privacy well. Usually the priest's booth is well lit so that he can read if he needs. This also makes it hard for him to see into the dark booth. Even the booths that are lit are dimly lit to both aid privacy as well as the penitent who needs to read a note or a prayer. Many of the confessionals we have seen were antiques that were rescued from churches that were defaced or destroyed. They frequently have the most ornate woodwork. One can see the labor of love in their decorations. They frequently are decorated with the symbols of the Catholic Church or some great penitent saints like St. Mary Magdalen. Over the grate, or next to it, there is usually a Crucifix to remind the penitent of the sorrow he should have for Our Lord's passion. This very sorrow is the measure of the grace the penitent will receive from this sacrament and the measure of Purgatory time removed. The only light is a courtesy light that is there in case the penitent needs it. Catholic Reconciliation with capital letters is the Catholic sacrament of Penance. In this we reconcile our lives with God confessing our sins and obtaining His forgiveness as Jesus said so on Easter Sunday night. Catholics have the consolation of knowing that this sacrament is effective when it is received in the proper disposition of sorrow for sin and purpose of amendment. Your sins are truly forgiven. Your soul is reconciled to God. It is that simple. Saint Anne's Helper Audio Catechism teaches the text of a good Confession and the doctrine necessary to know how to make a good confession with the First Communion audio or worksheet download which makes the memorization and review that much easier. "Bless me Father for I have sinned..."
Advent is a good time to start teaching about sin, penance, and confession during the First Communion year. Since the Roman Catholic Advent Season is a time of preparation for Our Lord's coming at Christmas many Catholics use the sacrament of Catholic Penance (Catholic Reconciliation) to make their confession at this time. According to the Douay-Rheims Bible St. John the Baptist "came into all the country... preaching the baptism of penance for the remission of sins.... A voice of one crying in the wilderness: Prepare ye the way of the Lord" (Fourth Sunday of Advent - Luke 3:3-4). Jesus Himself says in Luke 13:5 "No, I say to you; but except you do penance, you shall all likewise perish." True Catholic reconciliation requires penance as well as repentance. What better Advent preparation, than to follow Jesus' own advice to do penance while preparing for Christmas? Also, it is said that the more holy the Advent you have, the better your Lent will be. The more holy your Lent, the more you will rejoice on Easter Sunday! Lent is another great time to go to confession, especially to meet the Easter duty to confess and receive communion between Septuagesima Sunday and Trinity Sunday. This time we imitate Jesus Himself as He prepared for 40 days for His Passion and Death. 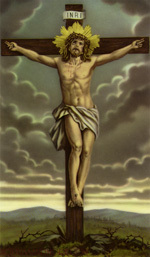 If Our Lord Jesus Christ prayed and did penance for so long for our sakes, just think what penance we must need to do. Jesus Is the Example to follow when trying to follow a Catholic Lent! The Catholic Church requires that one receive Catholic Penance (Catholic Reconciliation) at least once a year. Since she also requires that one receive Holy Communion at the Easter Time most Catholics also go to confession so as to be better prepared to receive Jesus in the Blessed Sacrament. The forty days of Lent is the penitential season of preparation for the death and resurrection of Jesus Christ on Easter Sunday. The season of Lent begins on Ash Wednesday. Here are some Lent activities for children. Few of us are able to resist the temptation to mortal sin and venial sin. What would we do without the sacrament of Penance if, as Jesus said, that nothing imperfect will enter Heaven? Thank God for this chance to repair! The Holy Eucharist is the sacrament which contains the Body and Blood, soul and divinity, of our Lord Jesus Christ under the appearances of bread and wine. (Baltimore Catechism No. 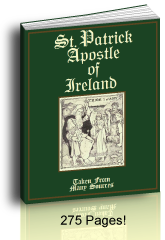 1, Q 238) Saint Anne's First Communion Audio Catechism (CD or Download) and Catechism Copybook teach the Roman Catholic beliefs about creation, Heaven, Original Sin, Hell, the Catholic Ten Commandments, Catholic Baptism, Catholic Penance, Holy Eucharist and the Mass. The best companion to this is the book Jesus Comes as published by Neumann Press. Confirmation is the Sacrament through which we receive the Holy Ghost to make us strong and perfect Christians and soldiers of Jesus Christ. (Baltimore Catechism No. 1, Q 166) Saint Anne's Catholic Confirmation Audio Catechism and Catechism Copybook teach the Catholic beliefs about the Blessed Trinity with an emphasis on the doctrine of the Holy Ghost; Jesus' Incarnation, Resurrection, and Ascension; the seven sacraments; the precepts of the Catholic Church and the Catholic Holy Days of Obligation and much more. The Confirmation questions come from the Baltimore Catechism.